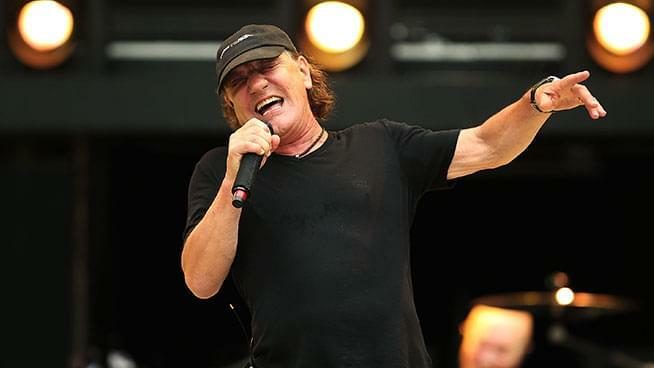 Reports are coming out that Brian Johnson will appear on AC/DC’s upcoming studio album. Rumors of Brian Johnson’s involvement with a new AC/DC record have been circulating for several months now. This all started when Brian Johnson and drummer Phil Rudd, along with guitarists Angus Young and Stevie Young, were spotted and photographed outside Vancouver’s Warehouse Studios. At the time fans were speculating from the photos that AC/DC were in the middle of making — or at least planning — another album, with Rudd and Johnson both back in the band’s lineup. Reports have also indicated that Angus Young will dedicate the new AC/DC album to his late brother, Malcolm. While AC/DC has yet to reveal any details of a new studio album, Brian Johnson apparently let the cat out of the bag recently when he ran into a band by the name of Terrorizer at an airport near his home in Sarasota, Florida. If this is true, this is exciting news for all of us AC/DC fans. The last few years have been very tough for AC/DC. Ever since the band completed their tour for its 2014 album “Rock Or Bust” more than two years ago, they lost founding member and guitarist, Malcolm Young. Plus, the departures of Brian Johnson, drummer Phil Rudd and bassist Cliff Williams. All of this combined has led fans to wonder whether the last remaining founding member Angus Young would keep the band going or decide it was time for AC/DC to call it a day. In case you missed it, Brian Johnson was forced to leave AC/DC mid-tour due to hearing loss and was eventually replaced on the road by Guns N’ Roses frontman Axl Rose. Cliff Williams decided to retire at the end of the cycle. Below is the Facebook post from Terrorizer. Rock Radio Personality Eddie Trunk discussed the possibility of AC/DC touring with Brian Johnson and releasing a new studio album. At this point we just have to wait and see what’s next from AC/DC.